When your kids walk to school (or ride a bike or scooter), they're setting the tone for a good day. Sure, sometimes distance, weather, and other safety considerations make such "active commuting" impossible. But if your kids have a mile or less to travel, they should hoof it. Here are five research-backed reasons why. By about age 10, kids are old enough to cross streets safely and handle other emergencies that may come up. Before then, crossing guards can help, and so can adult chaperones. (If you can't walk with your child, see if you can form a walking school bus or bike train—basically, a car-less carpool!) At least one study has investigated kids' active commuting rates and traffic injuries, and found that "a higher rate of children walking or biking to school has no significant association with traffic-related injury." Plus, when more kids walk to school, neighborhoods flourish—a virtuous cycle which makes them safer and more pleasant to walk in. As another study found, "Communities that have invested in infrastructure to promote walking or biking have shown increased property values, improved air quality, reduced urban heat injury (see #3, below), and greater social cohesion." When you avoid driving your kids to school, you save on gasoline and wear and tear on your car. Plus you're lessening carbon emissions that contribute to global climate change. 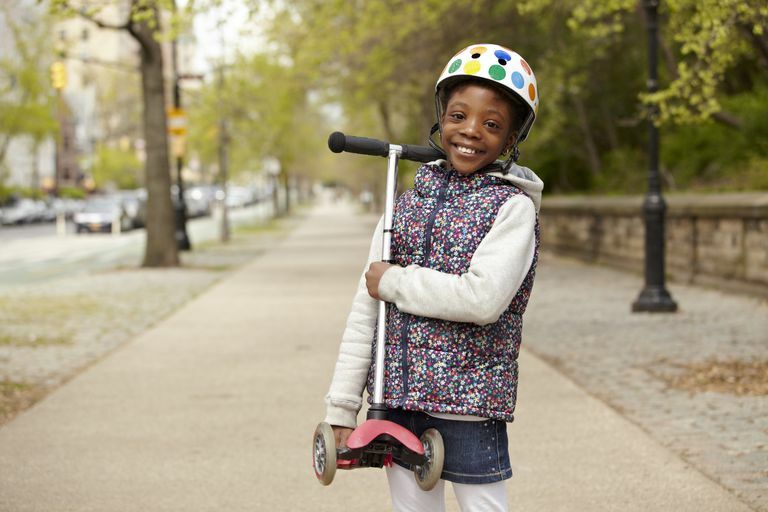 Several studies have documented how kids benefit academically from active commuting: They show higher academic achievement, better cognitive performance, better reading fluency, and improved executive functioning. One study that focused on kids with attention disorders found that just 26 minutes of daily physical activity "significantly allayed ADHD symptoms in grade-school kids." You'd be amazed at the conversations that you can have with your child while walking. And as Safe Routes to School points out, active commuting helps both parents and children "build a sense of neighborhood." When kids walk to school, parents are more likely to be involved at school and/or in the community. Drake KM, Beach ML, et al. Influence of Sports, Physical Education, and Active Commuting to School on Adolescent Weight Status. Pediatrics Vol 130, No 2, August 2012. Liu GC and Mendoza J. There and Back Again: Safety and Health on the Journey to School. Pediatrics Vol 133, No 5, May 2014. Mendoza JA, Liu Y. Active Commuting to Elementary School and Adiposity: An Observational Study. Child Obesity Vol 10, No 1, February 2014. Rothman L, Macarthur C, et al. Motor Vehicle-Pedestrian Collisions and Walking to School: The Role of the Built Environment. Pediatrics Vol 133, No 5, May 2014. Smith AL, Hoza B. Pilot Physical Activity Intervention Reduces Severity of ADHD Symptoms in Young Children. Journal of Attention Disorders Vol 17, No 1, January 2013. Van Dijk ML, De Groot RHM et al. Active Commuting to School, Cognitive Performance, and Academic Achievement: An Observational Study in Dutch Adolescents Using Accelerometers. BMC Public Health Vol 14, No 1, 2014. Which Sunscreen Ingredients Can Protect Your Kids from the Sun's Rays? Just How Dangerous Are Home Trampolines? Should Your Children Drink Bottled Water or From the Tap?